Hello! We're so happy you made it to our donations page. We will be accepting donations NOW through 5pm on October 3rd, 2014 (the day of our draw-a-thon). So don't wait to donate! You can submit your donation and drawing request now! Drawings will be drawn and live blogged on Tumblr 10/3 and then sent to you by mail. Children born with cleft cannot eat or speak properly, aren't allowed to attend school or hold a job and face very difficult lives of shame and isolation, pain and heartache. Some children are even abandoned—all because of the way they look. Their clefts usually go untreated because they are too poor to afford the simple repair surgery that takes as little as 45 minutes and costs as little as $250 dollars. Thanks to your help, we can save these children and give them the life changing surgery they both need and deserve. Thank you for joining me in Will Draw for Good and fundraising for Smile Train! When requesting artwork - please pick one thing that makes you smile, or consider donating accordingly if your request is complex. It make take some extra time to do the full scene you've described just right! Smile Train - Millions of children in developing countries with unrepaired clefts live in shame, but more importantly, have difficulty eating, breathing and speaking. Cleft repair surgery is simple, and the transformation is immediate. Smile Train’s sustainable model provides training and funding to empower local doctors in 85+ developing countries to provide 100%-free cleft repair surgery in their communities. Will Draw for Good is an annual event created, sponsored and hosted by OrangeYouGlad, a design studio in Brooklyn NY. Planet Argon is a web development studio in Portland. OR and is hosting our west coast location this year! Codephonic is a web development firm that built the "drawing randomizer" web app that is used by the artists during the draw-a-thons. Catering for our hard working artists provided by Famous Famiglia and Court Street Grocers. Paper and printing donated by PrintCraft RI. A note about copyright. Please note that the copyright for your new artwork belongs to the artist, even though the artwork belongs to you! You can use it for whatever personal stuff you like but you can't use it to make money directly or indirectly. You can take the drawing and put it on your refrigerator or share it on Facebook or use it on your family Christmas card, but you can't put it on a t-shirt and sell it, or use it on your company Christmas card or band flyer without the artists permission. 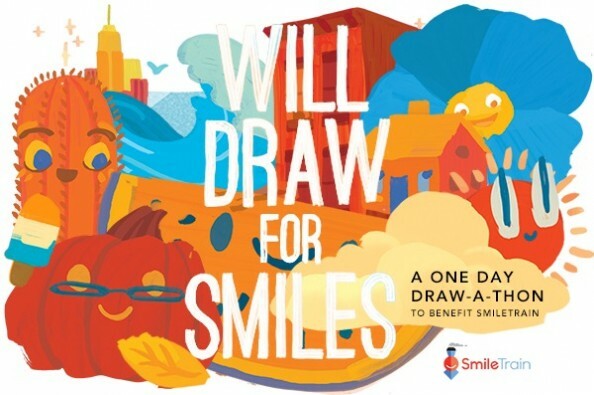 We completed 200 of the drawings on Friday - World Smile day -- and we've been hosting nightly follow-ups to complete the remainder - and we are ALMOST DONE! We will have our first big mailing mid-late next week. We appreciate your patience and your support. Thank you everyone for your generous contributions. We not only reached, but exceeded our goal! 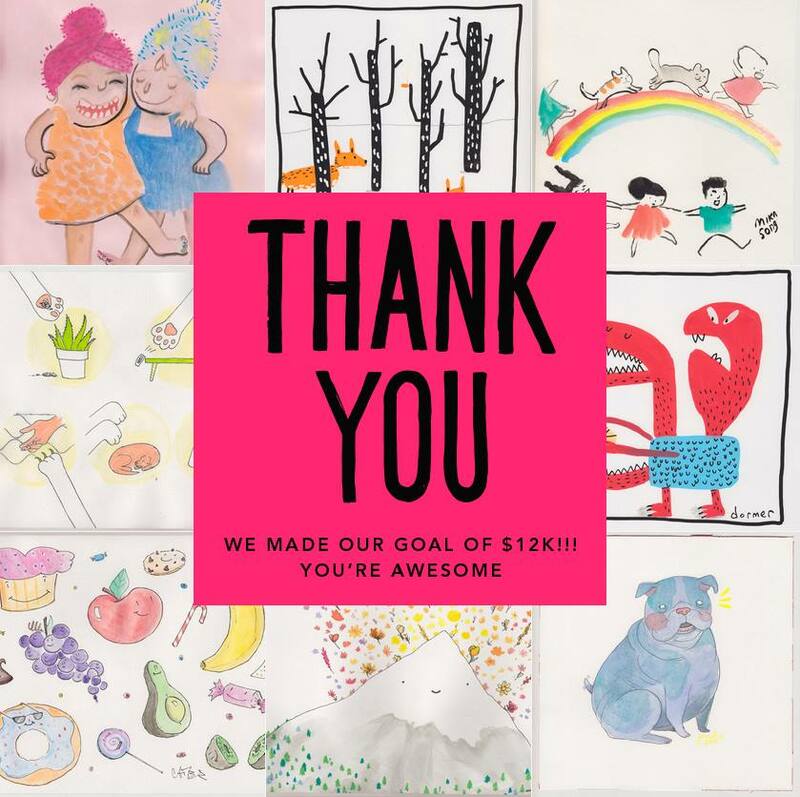 $12,530 and 285 drawings!! That's A LOT OF SMILES! We had an amazing day/night/early morning yesterday drawing your requests in both Brooklyn and Portland. We met extremely talented (and wonderful) folks who simply blew our minds with their drawings and with their generosity in contributing their talents to this event. Thank you artists! If you don't see your drawings well, there is a reason - we haven't finished them all yet*. *15 hours of non-stop drawing on two coasts and we were able to complete 200 of the drawing requests --which is a tremendous accomplishment. We have about 85 left to complete which will be happening this week. Keep your eye on the blog as we'll be adding new images daily. We then hope to have these mailed out in 2-3 weeks time (give or take a day or two). 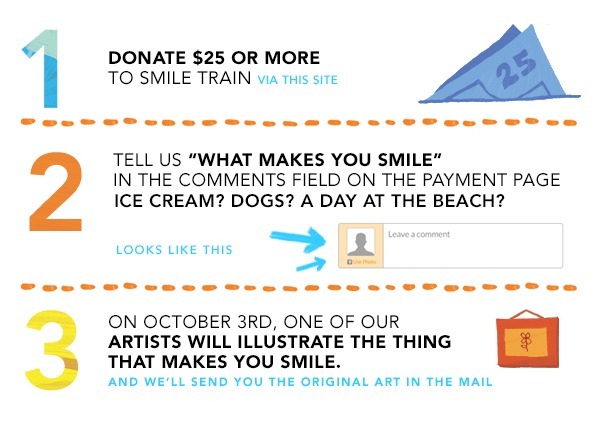 Last little note - for folks who didn't provide a specific request - if we weren't able to connect with you about "what makes you smile" we marked your drawing as "artist choice". So, expect something fun. Our sincerest thanks to you all. Thank you! We reached our goal. Supporters! You guys are amazing. We can't thank you enough for contributing to Will Draw for Smiles. We are busy sharpening our pencils and cutting paper and mopping our floors in preparation for tomorrow. Also - so many of you have incredibly fun lists of things that make you Smile, so much great material for our artists. We wanted to let you know that if you've listed many things in your request, the artists may pick the thing or two that they feel most inspired by to work into their piece (or they may do everything, who knows?!?). Either way - you are going to get something great AND you've helped give a smile to a child in need. You are a good egg! For those of you who have forgotten to list your request - we will follow up with you to get your info. Thanks again. We are up to $7,350 which is 29 surgeries! How does one become an artist for your worthy cause?